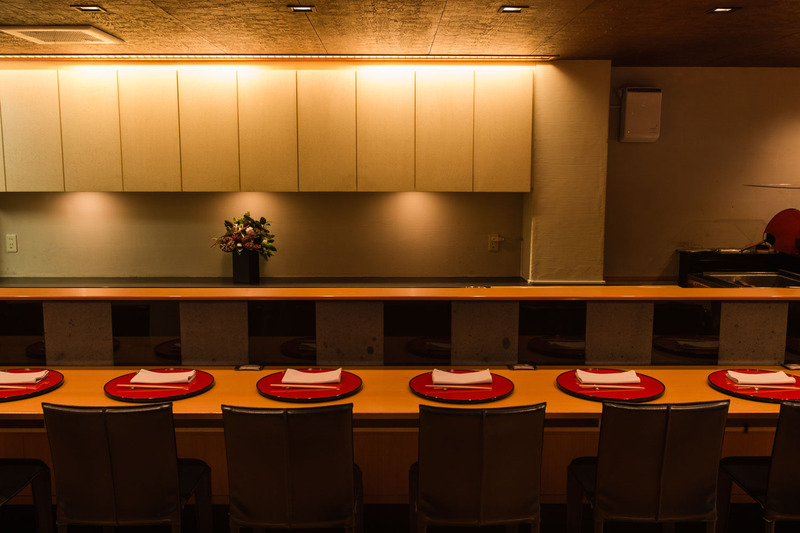 Wrapped in a warm atmosphere, Taian serves three-star Japanese Kaiseki—but without the formality. 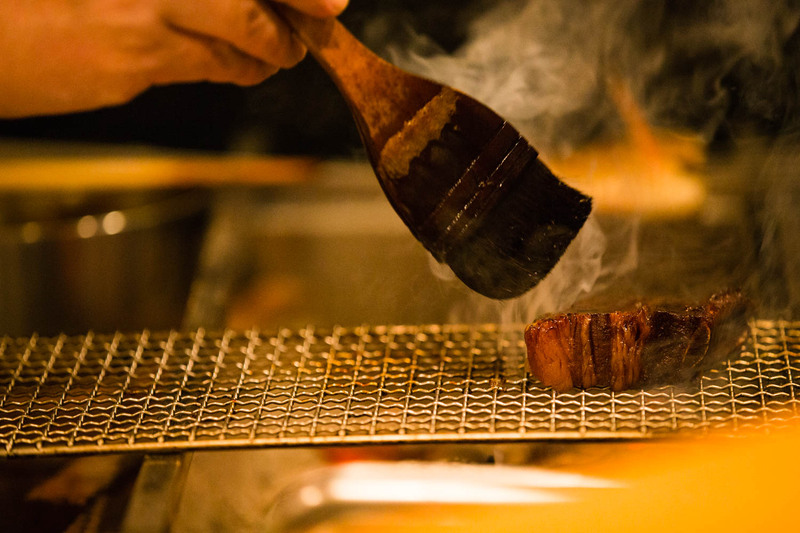 Replacing old rules with openness, Chef Takahata marries the best of traditional and modern, creating an inviting and beautiful experience for everyone. Taian sits on a quiet street in Nagahoribashi in Osaka. The Okami, the wife and manager, greets every guest with a gentle smile. 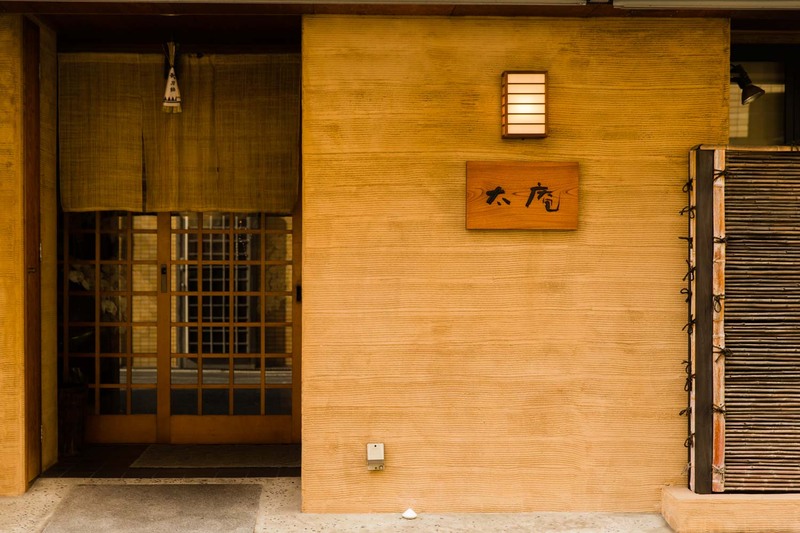 On the wall of the graceful entryway hangs an aged calligraphy scroll by the chef’s father. Next to it is a beautiful sculpture, a work of his daughter. Just a few steps in, you are touched by the Takahata family’s hospitality. The meal at Taian is to be enjoyed with all your senses. The interior of the restaurant is tastefully simple, a perfect setting to let the colors of the beautiful dishes come to life. Behind the long counter is a open charcoal grill with rods of burning charcoal crackling away. The sweet roasting smell alone is a delightful prelude to the feast to come. Simmer, steam, slice—The foundations of Taian’s cuisine is strictly traditional. But Takahata adds his own elements by blending in new ways of thinking. Rather than adding intricate decorations, the presentation of the dishes focuses on the ingredients themselves. The course opens with a picturesque tray of bite-size appetizers; Creamy chilled yuba topped with fresh wasabi; tender pieces of sea cucumber infused with Bancha tea; sweet shrimps with seared Toro tuna; thickened soup of Oboro seaweed with plump sea scallops; and light and crispy arrowhead chips. The dishes are served in beautiful little ceramics, each with such intricate designs. The soup dish that follows is a true gem. You gently lift the lid of the black lacquer bowl and find a piece of turnip decorated with thin strips of colorful vegetables. 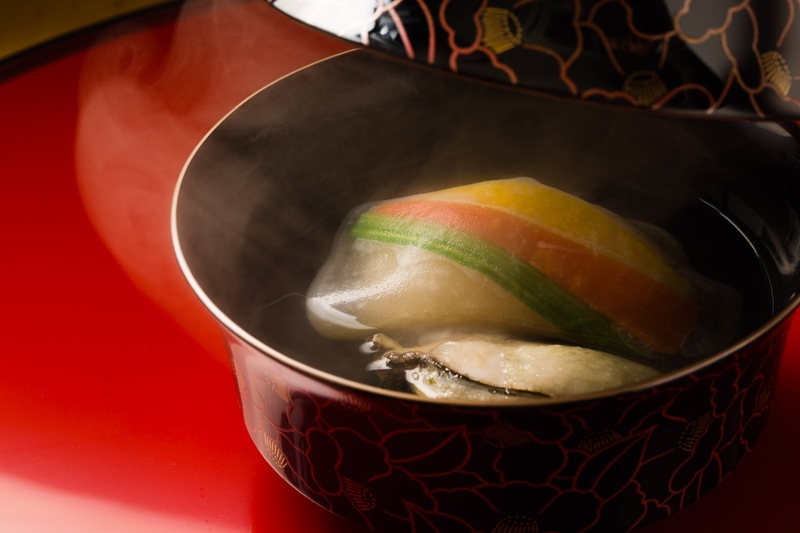 Perfectly shaped oysters rest gently in the warm dashi soup, bringing out the deep aroma of the sea. 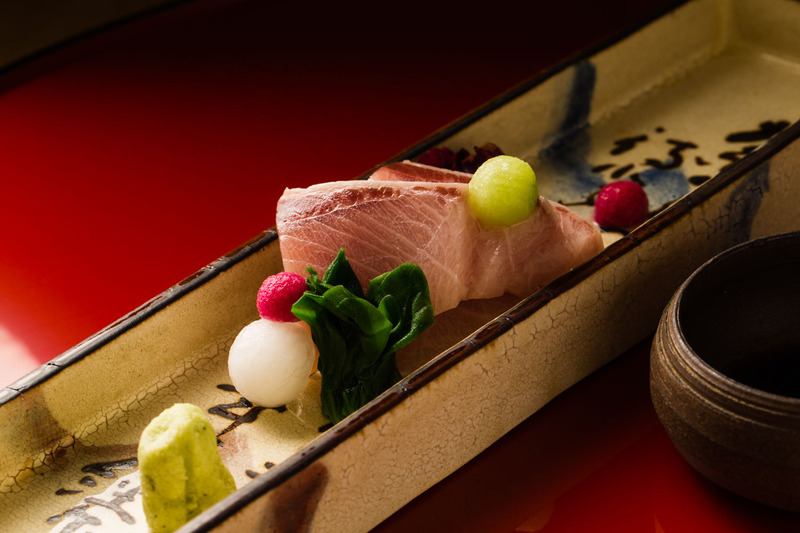 Sashimi of Japanese yellowtail is fresh yet sweet—each marbled piece so carefully sliced and and topped with little drops of colorful sauces. Among the signature main dishes is the tender wagyu ribs. Soaked in honey and red wine, the meat is blackened and smokey on the outside, and perfectly tender on the inside. 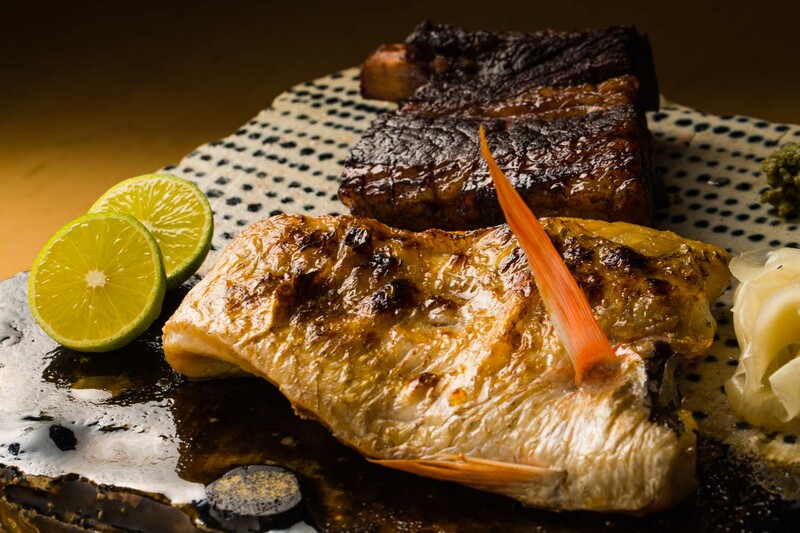 The Nodoguro seaperch is another favorite, the skin crisply burnt and on the roasting charcoal. Fried cod milt is a true delicacy as it requires both the freshest milt and skillful hands to fry without it falling apart. The rice cracker batter adds crispness and sweet aroma. 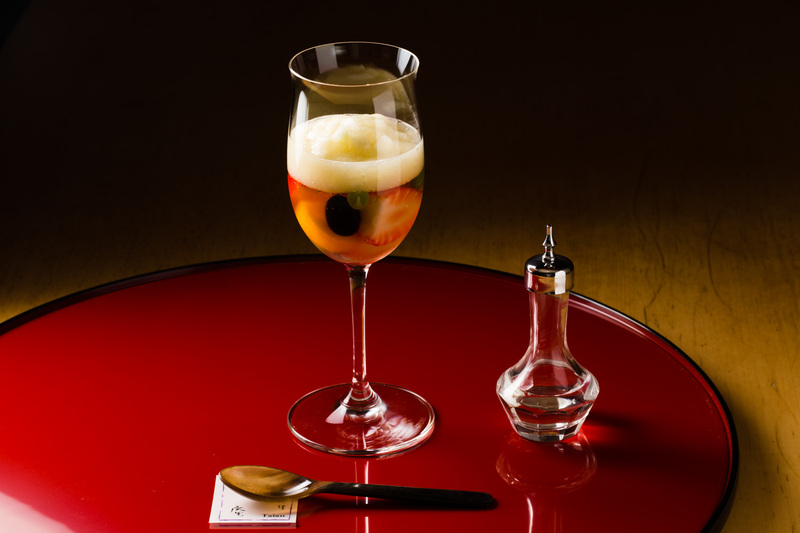 For dessert is persimmon and strawberry compote, so elegantly served in a tall wine glass. The gem-like fruits are soaked in Poire Williams, a beautiful pear liqueur, ending the impeccable meal with a modern touch. Takahata’s suppliers are concentrated around the local Kuromon market. Being based in Osaka, the market brings together the best from western and eastern Japan, he says. He also values his relationships with his long-time brokers, and keeps his orders within the familiar network. He believes the consistency helps foster a strong sense of trust that allows him to get his hands on the best supply when available. Takahata has fond childhood memories of his parents involving food. His father was a chirography master with a passion for fine dining. Even as a little boy, Takahata got to tag along to many restaurants where he mingled among crowds and discovered new flavors. His mother was a lover of cooking and a gracious host. She would often invite her husband’s students for a relaxing home-cooked meal, filling her kitchen with delicious foods and loud laughter. Raised by such parents, it was only natural for Takahata to want to bring happiness to people through food. 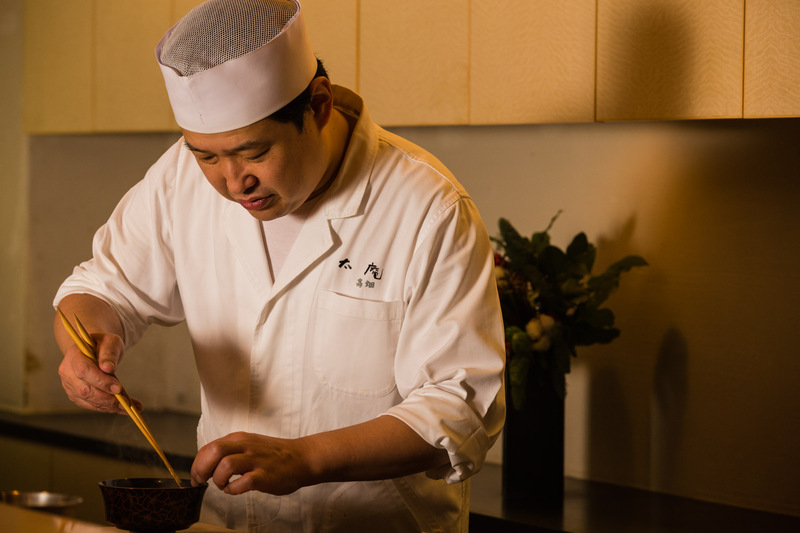 Right after graduating high school, he began his culinary career through apprenticeship at Ajikitcho, an established Kaiseki restaurant. The renowned head chef, already in his 70s at the time, took young Takahata under his wings and mentored him every step of the way. “It was pretty tough at times but all I remember now is how fun it was,” he recalled. After 15 years of intensive learning, he felt ready to open a restaurant he could call his own. The early days were a struggle where him and his wife faced countless challenges. But thanks to their commitment in delivering only quality, the business slowly began to take shape after about five years, leading to the honor of three first Michelin stars in 2011. “I love cooking so much I even want to die in the kitchen,” Takahata said jokingly when asked about his passion. Takahata’s simple wish is to make Kaiseki accessible to people of all nationalities, ages, and backgrounds. 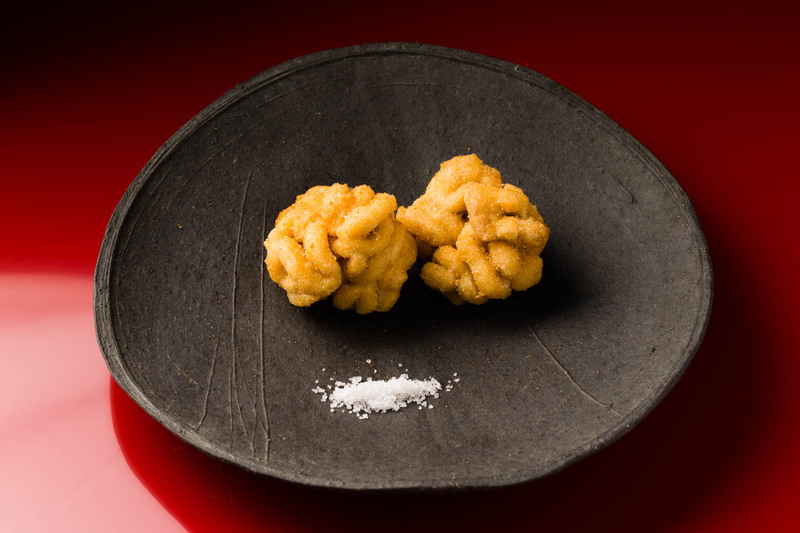 Given all the formalities of the cuisine, he fears that more and more people, including the Japanese, are turning away from the traditional dining. Against his worry, Taian has managed to attract more fans over the years thanks to his open-minded philosophy. At Taian, it’s the guest that makes the decisions, not the chef. 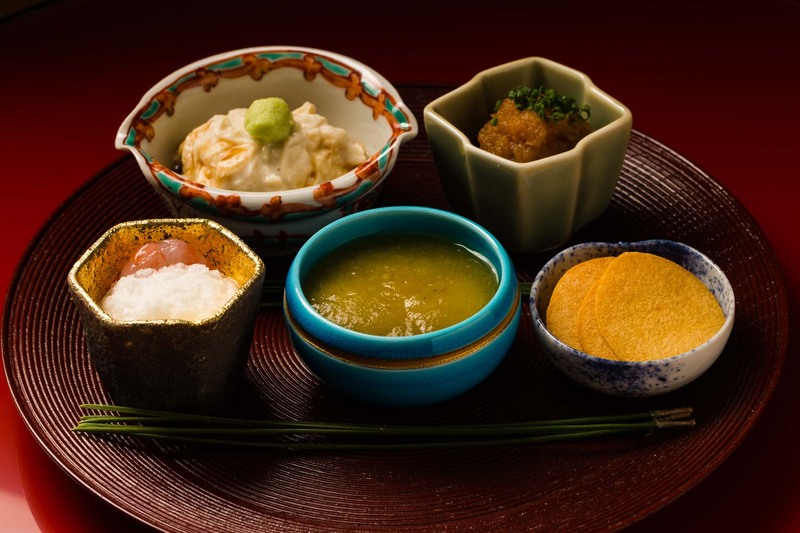 Unlike at most traditional Kaiseki restaurants, the guests at Taian can choose from a set of five or so main courses. Breaking away from the old ways of serving just fish and vegetables, he offers meat dishes in hope to lure younger people or international guests. To his surprise, many older guests too have loved the meat dishes. “Take away the fences and stand tall,” are the words stroked on his father’s scroll, serving Takahata as an important reminder of his vision. Taian was early to pursue pairing of western wines and Japanese food. 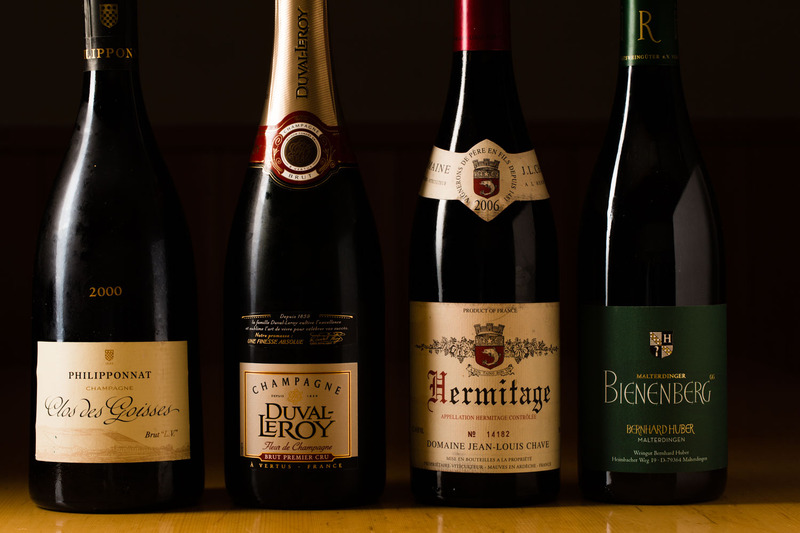 Wines tend to bring out the bitterness in the food, so finding an agreeable match requires careful selection. His collection consists mainly of Chardonnay and Sauvignon Blanc from Burgundy. He also has a nice selection of reds to complement the meat dishes. 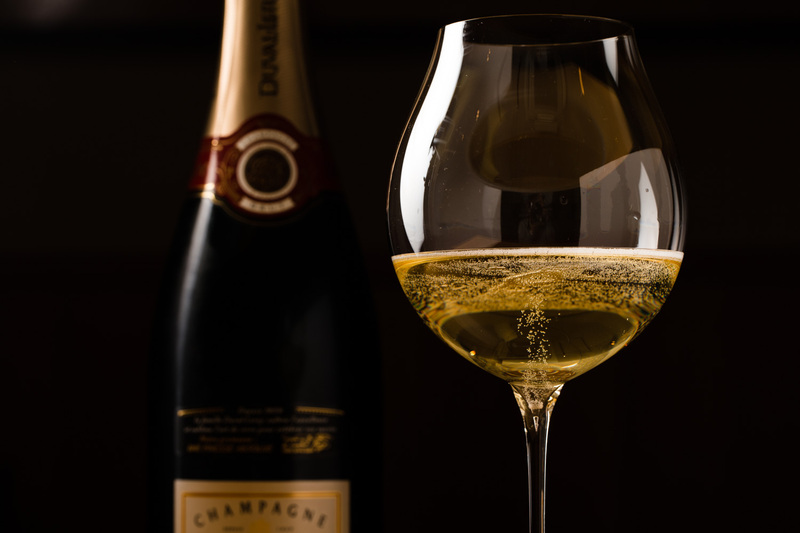 His favorite aperitif is a crisp glass of Duval Leroy from Champagne.